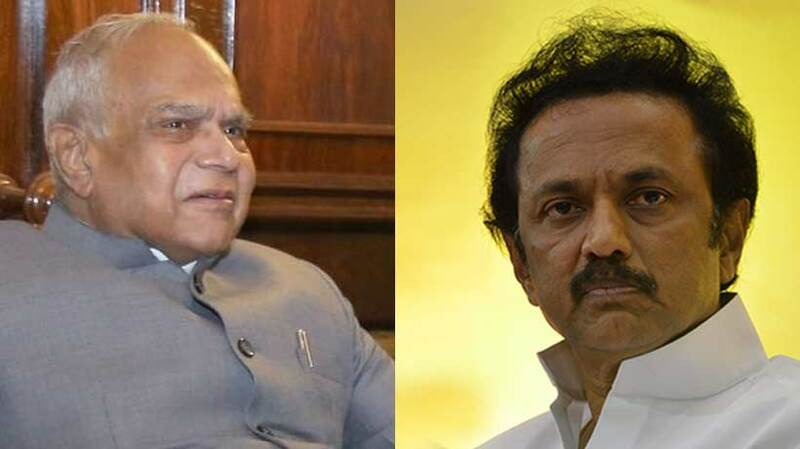 Principal opposition party in Tamil Nadu, the DMK on Thursday lashed out against state governor Banwarilal Purohit for touring the state as if he was an elected leader and the state government was absolutely silent over the issue. DMK working president MK Stalin told media persons in Kancheepuram that the Constitution had not given permission to Governor to oversee if the state and central government projects are being implemented properly by the state government. After visiting Coimbatore, Tirupur and now even in Tirunelveli, Governor Purohit held review meetings with district administration officials, something that the political parties insisted was the prerogative of the elected chief minister and MLAs and not the governor who is nominated by the centre. “The ruling AIADMK seems to be in alliance with the Central government,” Stalin said the Raj Bhavan has allowed a minority government to continue. And now the governor is directly interfering with the functioning of the government, he charged. Rather than visiting districts and holding review meetings with government officials the governor must ask the Edapaddi Palaniswami government to immediately prove its majority on the floor of the house. Politically Tamil Nadu is witnessing a drama, the latest episode in RK Nagar constituency, where returning officer for the bye poll was behaving in a partisan manner. Stalin referred to the rejection of nomination papers of actor Vishal as an example of the returning officer’s behaviour. The way things are going, polls in RK Nagar could be countermanded this time as well, the DMK working president said. Stalin also used the occasion to take the central government to task on the missing fishermen from Tamil Nadu who went fishing in high seas and failed to return. They are suspected to be the victims of cyclone Ockhi. The chief minister and deputy chief minister have failed to come to the aid of the fishermen. Stalin demanded immediate rescue attempts to bring back the fishermen to safety.